What is PV Permit Design? PV Permit Design is a new software service for PV installers to easily generate required balance of system (BOS) designs and associated documentation for residential scale PV permitting. The service reduces engineering time for installers, and reduces review time for building officials. Computer managed data and design calculations reduce errors that cause building officials to reject PV permit applications – reducing rework. The PV Permit Design service is no longer accepting new users. Support for the service has been discontinued. NOTE: Current SolarNexus and SolarDesignTool subscribers have access to the PV Permit Design features within those applications (DO NOT log in to pvpermitdesign.com). 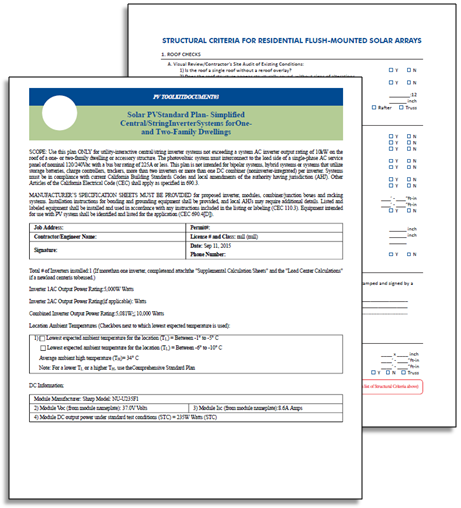 Send Email to pvpermitdesign@solardesigntool.com if you’re interested in integrating PV Permit Design features into your software. PV Permit Design benefits installers of all sizes, and makes life easier for building officials receiving design documentation generated by PV Permit Design. Contractors can access the PV Permit Design service using the PV Permit Design.com website, OR via another PV design/quoting software that includes the PV Permit Design service (SolarDesignTool and SolarNexus are two vendor applications working to integrate the PV Permit Design features into their current software – tell your vendors to add the service). Contractor requests a PV permit design for an existing ‘sales design’ (modules, inverter(s), and source circuits need to be defined) – software submits the sales design to the PV Permit Design service. Based on the ‘sales design’, PV Permit Design asks contractor to specify relevant BOS equipment (use J-boxes? combiners? AC/DC discos? wire and conduit types, circuit lengths?). What is a Qualifying Residential PV Install? PV Permit Design only applies to small-scale residential PV permit installs which make up about 80% of the solar market. The following requirements are from the SolarABCs Expedited Permit Process for PV Installs and are also used by the California Solar Permitting Guidebook published by the CA Governor’s Office. the array has a distributed weight of less than 5 lbs/ft² AND less than 45 lbs. per attachment. the inverters (micro, or max 2 central) output is 13.44 kW or less (maximum size for 70-amp breaker) AND is connected on the load side of the service disconnect. What Documents Does it Generate? 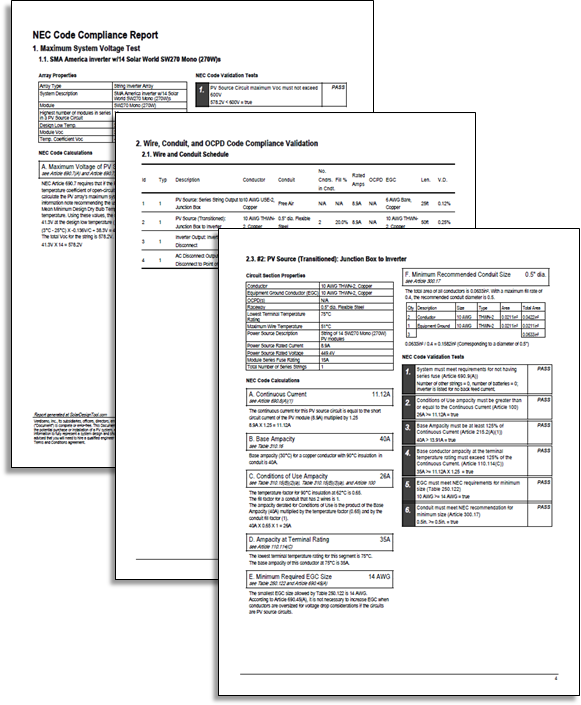 The PV Permit Design service generates the following documents. You can select which documents you want to generate as well as provide preferences for sheet size and fonts. 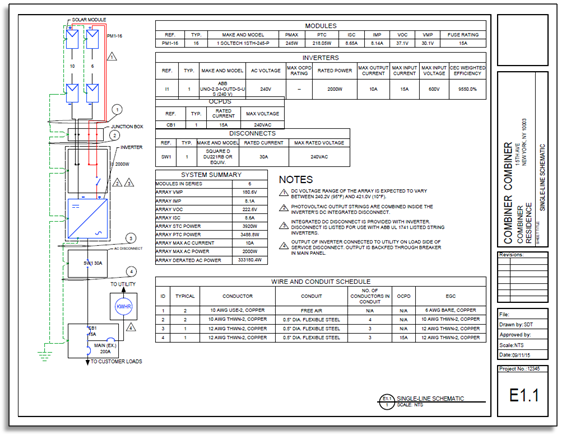 1) Single Line Electrical Diagram (PDF, DWG, DXF) – standard format and content simplifies review. Optional output to DWG or DXF formats enable additional editing within your CAD tool. 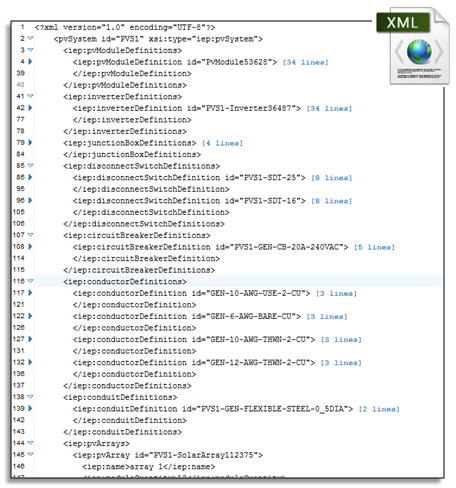 4) Complete documentation of design (XML) – Uses free standard, public IEP Model data format. 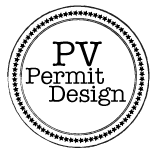 Machine readable, simple to store. Can enable fully digital permitting in the future. There are many issues with PV permitting that have been expressed by building officials and solar installers alike. These issues lead to higher costs on both sides primarily due to hours spent reviewing, resubmitting, and reworking PV permits. SolarNexus conducted detailed surveys of 27 AHJs and 25 residential installers to learn more about these issues and determine how PV Permit Design could help. Some issues include confusing PV permit requirements that vary from city to city, incomplete or incorrect electrical calculations, incomplete supporting documents, just to name a few. 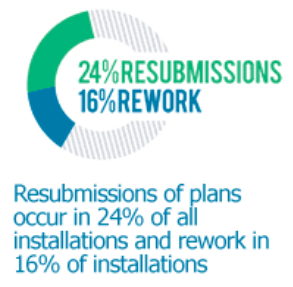 Our goal is to reduce the percentage of PV permit resubmissions or rework and reduce the amount of time required to review SLDs, NEC code calculations, and structural reviews. Our solution doesn’t cover all permitting documents and doesn’t apply to every install but we are addressing the most complicated and time-consuming documents that are required for about 80% of solar installs in the U.S.